Be the first to share your favorite memory, photo or story of Barbra . This memorial page is dedicated for family, friends and future generations to celebrate the life of their loved one. 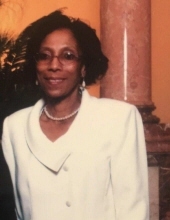 Smith, Barbara R., 68, of Louisville died Saturday October 20, 2018 at Sacred Heart Village. She was a retired employee for the United States Census Bureau and a member of Portland Memorial Missionary Baptist Church. Survivors include two daughters Reginale D. Rattler and Rhonda D. Rattler; two stepsons Rev. Stephen Smith (Odessa) and Leon Smith (Margaret); four grandchildren Ryan Rattler; Chancelor Rattler; Chadwick McDowell and Taylor Owens. Her funeral service will be held Saturday October 27, 2018 at Portland Memorial Missionary Baptist Church 3800 W. Market St., with burial in Green Meadows Cemetery. Visitation will be 10:00 AM to 12:00 PM Saturday at the church. To send flowers or a remembrance gift to the family of Barbra R. Smith, please visit our Tribute Store. "Email Address" would like to share the life celebration of Barbra R. Smith. Click on the "link" to go to share a favorite memory or leave a condolence message for the family.